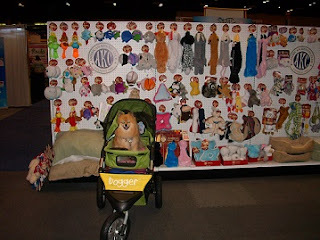 Pepper's Paws: Let's Bark About Global Pet Expo 2013! Let's Bark About Global Pet Expo 2013! OMD!! So much to bark about! It was three days of dizzying amounts of new products and people. This photo collage should give you some idea of how large it was. Even with 3 photos, I didn't get it all. I would have probably needed another 3 or 4 photos. Where to begin?---- I think, for us, it started the night before, when we checked into our hotel. BOL!! Our hotel neighbor had a booth at Global Pet Expo. He showed us his pawsome, unique product. Before we checked out of the hotel on Saturday, he gave us a box of his handy product to review. I have enough to do a giveaway! BARK! BARK! 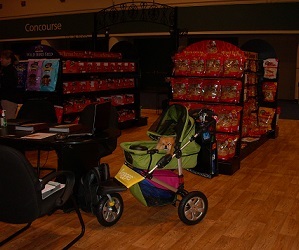 PetSafe press conference where they showed us a record number of new products! We saw several twitter pals and met some in furson for the first time. I posed for a photo with @GizmoGeoDog. The photo is on his blog, his mom snapped the photo. My mom had her hands busy giving me signals and holding a treat. I had lunch with Lulu from Life With Beagle. There is a photo of me on her blog too! I went to dinner with several human pals and Pearl from Nikki Moustaki. I saw Kona of K9 CarryAll, and Dexter from Fidose of Reality was also there! OMD! 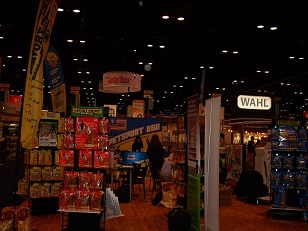 Look at all those toys in the Pet Brand booth! Of course, with all the cool pups around, I had lots fun barking, and barking, and barking! I barked so much that I had a training session with Dr. Mugford of The Company of Animals on the first day. He demonstrated a few of his furrific training products on me. Naturally, I will review them for you. I did bark less after my time with Dr. Mugford. I was back to barking the next day because Mom didn't use all of the new products on me; plus she was too distracted to get her timing correct. BOL! Score one for Pommie persistence! I outlast Mom every time! BOL! Mom says we will be using the training items again, now that we are home. Who do you think will win round two - me or Mom? 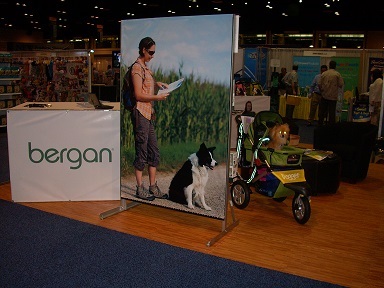 I posed for a photo at the Bergan booth. I had fun barking every time we zoomed to the potty grass outside. "Faster Mom, I gotta pee!" I am pretty sure everyone heard me, even if they didn't see me. BOL! My new stroller sure got a workout! It was busy zooming from one end of the exhibit hall to other. It is worth every penny it cost. BOL! We had lots of people asking us about it. They wanted to know what kind it was (Dogger), if it was in a booth at the show (it wasn't), and where they could get one (http://www.dogquality.com/dogger.html ) and ( http://www.nipandbones.com/the-dogger-stroller.html ). Here I am relaxing in my stroller at the Scott Pet booth. 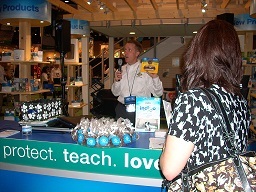 We went to several interviews, and saw hundreds of new products. We missed about 20+ booths that I really wanted to see. We did our best, Mom walked until she was ready to collapse. We just didn't have enough time, even with all of the zooming. Mom will need to do a better job of scheduling our appointments next time. There were tons of treats to sample! Mom allowed me to try several, after she asked a couple of safety questions and approved them first. You know how Mom is, always concerned about my health and safety. Naturally, I will review a few of my favorites for you. I think I have barked myself hoarse. BOL! Don't worry, I will bark more about Global Pet Expo 2013 in another post. Now it's your turn to BARK! BOL!! High Paw Gizmo! I hope to see more of you next year! :) That is, assuming I can go, and you can go. BOL!! Thank you Caren! I appreciate each comment. :) I did see them, but I don't know how to reply to comments by phone. I can only talk, tweet, take pictures, text, and read/send email from it. BOL!! Not to bad, considering I haven't had a smart phone for a whole year yet. BOL!! Awww, shucks, it is tons of fun. There is lots of kitty stuff!